Oh Snap. HP may be launching a new glossy, white webOS tablet in August. This new model comes hot on the heels of the original TouchPad which launched last week. A leaked roadmap and some "closed-door conversations" suggest the new TouchPad could include 64GB of storage and a faster 1.5GHz dual-core processor. 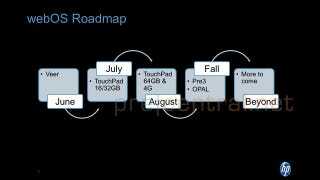 The same roadmap also hints at a 32GB version with AT&T's flavor of 4G (HSPA +).